Haruki Murakami, the internationally bestselling author of Norwegian Wood and The Wind-Up Bird Chronicle, plunges us into an urbane Japan of jazz bars, coffee shops, Jack Kerouac, and the Beatles to tell this story of a tangled triangle of uniquely unrequited loves.A college student, identified only as “K,” falls in love with his classmate, Sumire. But devotion to an untidy writerly life precludes her from any personal commitments–until she meets Miu, an older and much more sophisticated businesswoman. When Sumire disappears from an island off the coast of Greece, “K” is solicited to join the search party and finds himself drawn back into her world and beset by ominous, haunting visions. 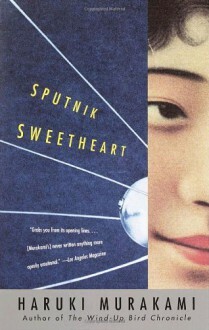 A love story combined with a detective story, Sputnik Sweetheart ultimately lingers in the mind as a profound meditation on human longing. THIS IS IT! My favorite Murakami book...I love it!